With any search engine optimization campaign, the goal is to create a steady stream of ongoing and reliable traffic to your website in an organic way. However, if we put our reality cap on, it’s likely that your traffic will plateau and you’ll notice a level-off that just doesn’t seem to budge. To be honest, this type of pause is generally temporary and to be expected. Long-term SEO campaigns see moments like these and there are hundreds of factors to consider. One thing you shouldn’t really see is an active sustained decline in your site’s organic traffic. A minor decrease is no reason to freak out since it could simply be a short-lived drop in consumer interest, but if you’re noticing that this dip has been lasting for several weeks, it’s time to take a closer look. One of the first things you should rule out in this situation is a manual penalty. They’re pretty rare and unlikely coming from Google, but since they can be easily identified it’s best to start here. If you find that you currently have a manual penalty, your traffic will take a nose-dive and you’ll see a notification in the Google Search Console. The notification will tell you that your site has recently been penalized if in fact that is the case. If you’ve looked and found nothing, then you’re probably good to go. Of course, if you did receive a penalty, the best thing is to correct the problem that caused it in the first place. Likely causes are plagiarized content, spam-infested content, or “black hat” SEO practices. To start the recovery process, appeal the penalty with Google and patiently wait for it to be removed. A manual penalty wasn’t the cause, huh? The next thing you can do is to determine the main areas of your traffic dip. 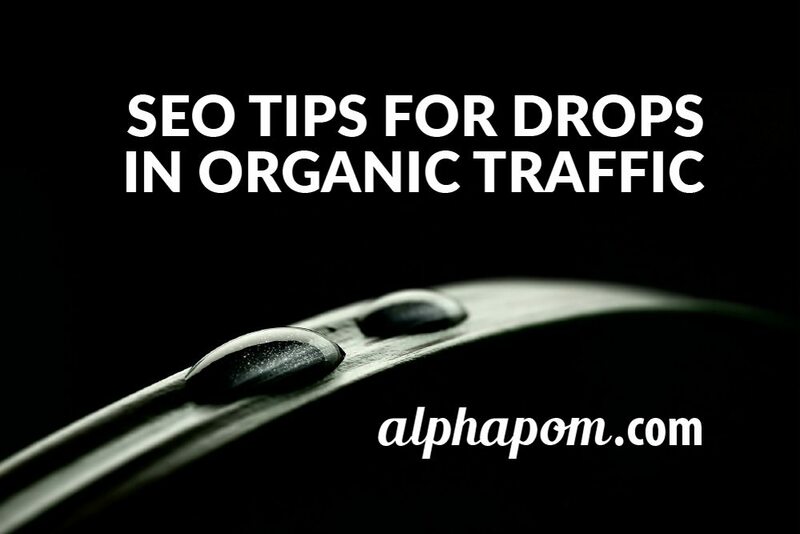 While you’re probably thinking about the fact that your entire site hasn’t received much traffic, it’s likely that the dip can be linked to some of your specific pages or keywords. Now let this information be your guide for the rest of your audit. If you’ve found that one specific page is the culprit, you can look at the page’s competition, examine your links, and revise any of the content as needed. If you’ve noticed that your competition has changed in the last few months, focus on your search positions for specific keywords. It’s possible that in this amount of time, new competitors have hit the market or old competitors have changed up their game. If you need to, start engaging in more direct and head-to-head competition by adjusting your SEO campaign. If you’re stuck in an SEO rut and you need a little help adjusting your campaign, be sure to reach out to the digital marketing team at Alphapom. We’re a locally owned and operated business out of Cedar Rapids, Iowa and we love working with search engine optimization. Contact us today to discuss your online marketing needs.